As a party getaway Ibiza needs little introduction. It has been at the forefront of Europe’s dance music and clubbing scene for at least 25 years now, and its super-clubs and bars are now legendary. You can follow up wild nights out with therapeutic days at some jaw-dropping beaches. For older visitors and those with families Ibiza has just as much to recommend it: You can journey into the UNESCO-listed Dalt Vila in Ibiza Town or take a tour of the beautiful whitewashed villages in Ibiza’s quiet and rural interior. All the while the island’s 15 Blue Flag beaches will be just a short detour away. The highest and oldest part of Ibiza Town is guarded by strong renaissance fortifications built by Charles V in the 16th century. The walls were constructed to fend off the threat of attacks by Berber pirates as well as invasion by sovereign forces like the French. It’s well worth taking a little tour of the fortifications to check out the seven bastions, each with a slightly different story to tell. The Santa Lucía bastion for instance houses an 18th-century powder magazine and commands fabulous vistas over the old fishing district and the harbour. Inside the walls is a steep warren of alleys that you’ll have a lot of fun exploring. These are packed with galleries, boutiques and local amenities like bakeries. Occasionally they’ll open out on to charming old squares like Plaza de Sa Carrosa and Plaza de la Vila. At the very top of the old city is the cathedral, which sits next to a scenic outlook over the water. Potter around inside for a few minutes to see the gothic gold and silver monstrance, dating to 1399, and the 14th and 15th-century gothic panel paintings. Ibiza’s main resort is next to the longest beach on the island. On summer days it’s a paradise for the young party crowd; you can sleep off the night before under a parasol as relaxing, low-tempo music from beachfront djs wafts over the shore. If you can work up the energy jet skis and paddleboats can be hired next to the beach, and there a load of places to pick up food when you get hungry. After dark and until the sun comes up it’s party central, with two of Ibiza’s largest clubs, Ushuaia and Space right in the resort. On the west coast of the island, Ibiza’s second-largest town was notorious in the 80s and 90s. These days it’s grown up a little, but is still the best choice if you’re after that heady combination of beaches and world-famous nightclubs. Head to the bay during the day for the narrow sandy beaches bathed by crystalline seas, or to amble along the promenade stopping somewhere for a beer of coffee along the way and taking in the Columbus egg monument. As the sun goes down hit Cafe del Mar, which has been playing lounge music for more than two decades as guests watch the famous sunset. At night there are buses to the legendary superclubs, Eden and Es Paradis. If you’re based in Ibiza Town and fancy a quieter day at the beach then couple of minutes up from the marina is another of the island’s largest beaches. Here there’s a wide sweep of snow-white sand backed by low-density development. The scenery around Talamanca is made up of small, pine-cloaked hills and the small holiday community of Cap Martinet. Right on the beach are great little places to eat, serving Balearic culinary favourites like bullit de peix or more cosmopolitan options. The beach is tucked deep between two headlands so the waters are gentle and child-friendly. Ibiza isn’t all about riotous nightlife, as you’ll discover at a popular family resort on the east coast of the island, around 15 kilometres northeast from Ibiza Town. Nearly all of the resort’s seafront is golden sandy beach, and with the bulk of the resort right behind there’s loads of shops and eateries to make your day a little more comfortable. There’s also a pretty little promenade running behind, decorated with wrought-iron lampposts and benches beneath the lush fronds of palm trees. Ibiza’s only golf course is also right next to this resort should you crave a round, and the weekly Las Dalias Hippie Market takes place a few minutes away in San Carlos in Saturdays. Also try climbing the Puig de Missa hill to see the cute old church at the top. For a relatively small island like Ibiza it’s amazing how remote and wild the northern tip can feel. This part of the island has pine forest, farmland and a coastline scattered with little holiday communities clustered around coves that cut deep into the coastline. 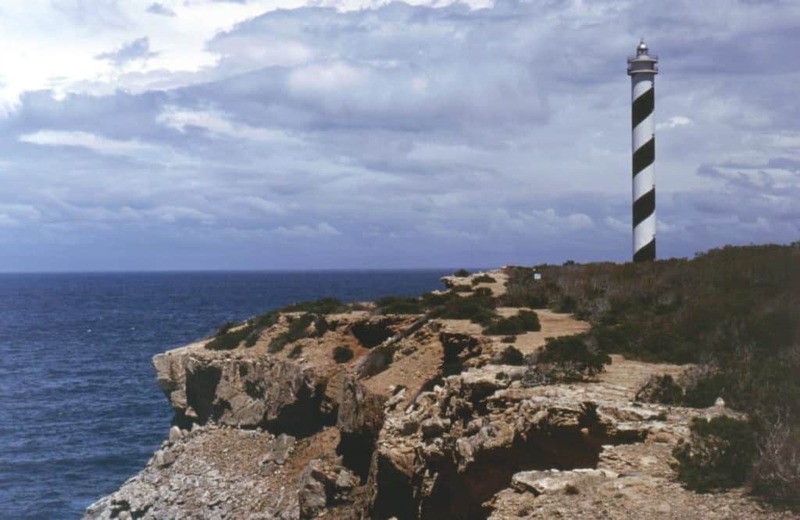 For something a bit different, put on a pair of sturdy shoes and walk the cliff-top trail from Portinatx to the lighthouse. It was built in the 70s and at 52 metres is the tallest man-made structure on the island. The trek through pine scrub and juniper is a bit of a challenge, but the photos you can take from the headland here make it all worthwhile. People in the know rate this beach on the west coast of Ibiza as the best on the island. It’s not too far from San Antonio, and in the summer you’ll be able to catch a bus or ferry to get here. What you’ll see when you arrive will blow you away. It’s an 800-metre strip of sand that hugs the twisting contours of the rocky coast. Offshore is a small wedge-like island and this helps to create large, lagoon-like pools of shimmering turquoise water. The bars on the rocks behind will fill up in the summer evenings, as the sunset here is stunning. This uninhabited island off the southwest coast of Ibiza is protected as a natural park. You can get there by boat from San Antonio or Ibiza Town, while the water sports centres around the island organise jet-ski tours or snorkelling excursions here. It’s a beautiful, almost otherworldly place; a rugged island with a monolithic slab of sheer limestone that crests at 413 metres. Climb ashore and bring your camera to capture the drama of the landscapes and the wildlife including goats, lizards and falcons. 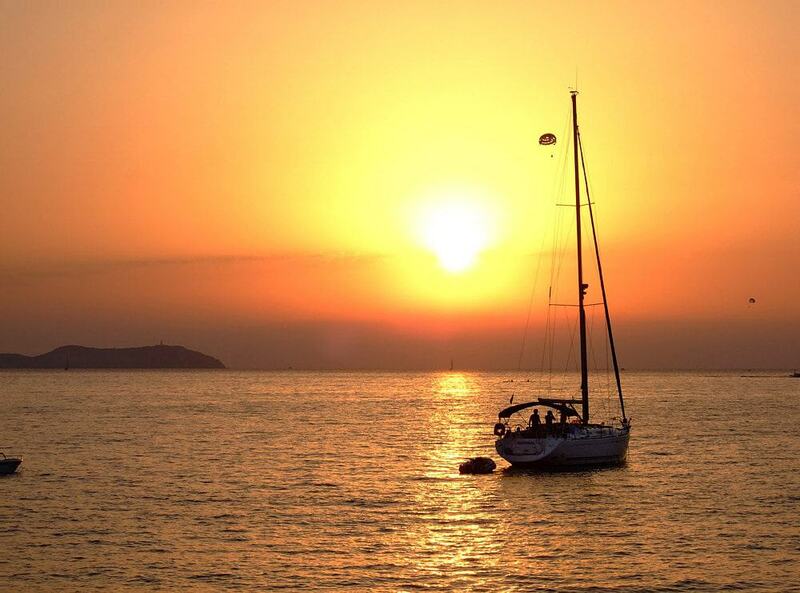 Ibiza is almost as well-known for its holistic spa and relaxation scene as it is for electronic music and nightclubs. There are 15 spas across the island, many attached to hotels and apartment complexes, and others that are clubs that open their doors to visitors as well as members. Atzaró Spa for example belongs to a serene agritourism complex surrounded by the citrus and olive groves of the Ibizan countryside. The choice of treatments and activities at this place alone is staggering: You could work out in the state-of-the-art gym, take a yoga class, float along in the 43-metre pool or pamper yourself with anything from peels, facials, manipedis and a variety of massages. On Ibiza the sea is your playground. All of the main resort beaches have a watersports centre for jet-skis, parasailing and water-skiing and other motorised fun. Stand-up paddling and kayaking are also on the menu here. At the port in Ibiza Town you could also charter a yacht: You can sail alone if you’ve got the experience or hire a boat with its own captain to take you anywhere you want to go around Ibiza’s craggy coast. You could also take your adventure beneath the waves. There are 17 diving schools on the island, and it’s a wonderful activity here as the water clarity is so high and there are all kinds of caves and underwater drop-offs to see. There’s a pork delicacy unique to the Balearic islands that is well worth trying. Sobrasada is a kind of cured sausage akin to chorizo, with soft, ground pork seasoned with paprika. It’s loved across Spain but originates in Ibiza and Mallorca. 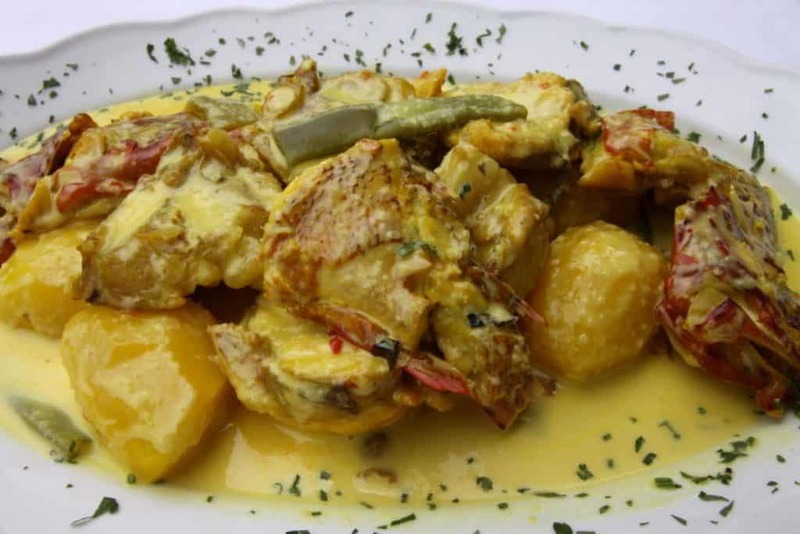 For a delicious and authentic main course, try bullit de peix, a fish stew served at local restaurants around the island. It’s made with grouper and potatoes, but these are accompanied by lobster and shrimp, and the whole things comes with a aioli on the side. Chances are that you won’t have experienced an aquarium quite like this before. The attraction is minutes outside San Antonio, down in a sea cave where local fishermen used to set their lobster traps. Now kids and grown-ups can head underground to see all sorts of marine species, including grouper, rays, morays and conger. The attraction is also a recuperation centre for sea turtles. 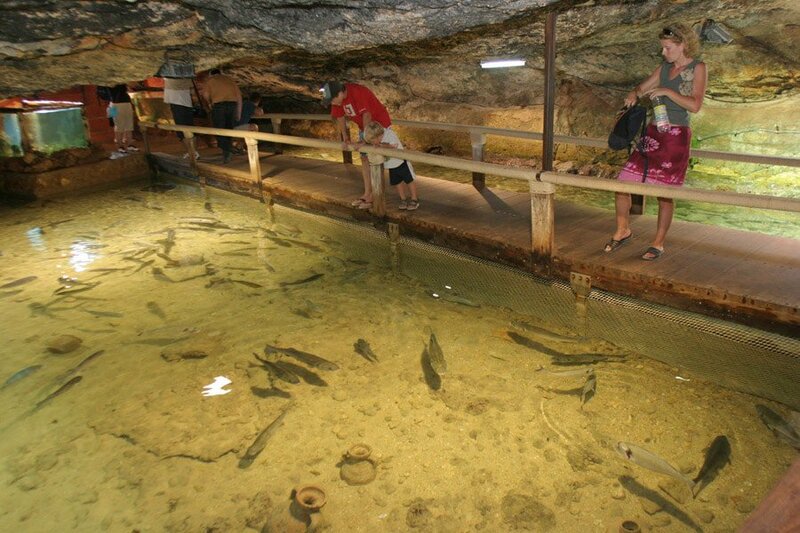 You’ll be able to admire the sea-life from raised boardwalks, running above the cave’s well-lit pools. For families, Ibiza has few of the showy attractions of big Mediterranean resorts, such as water parks and fun fairs. Instead, attractions for kids are a little more low-key and nature-oriented. On the outskirts of Ibiza Town is Horse Valley, a stables that rescues mistreated horses and ponies and organised a range of excursions around the rugged northern region of the island. For some action on four wheels there are also go-karting tracks at both San Antonio and Santa Eulalia. Everyone visiting Ibiza should consider catching a ferry to Formentera, off the island’s south coast. Formentera has an ambience and appearance a world away from most Mediterranean destinations. Firstly the beaches (Playa de Ses Illetes, Calo des Mort) look almost tropical, like the kind you’d find in the Caribbean, with turquoise waters and sugar-white sand. To get about Formentera’s unspoiled interior you can hire a bike for the day and then be free to set off along dusty tracks that snake through little whitewashed hamlets. As you go you’ll never be more than a few hundred metres from the coast and another immaculate sandy beach.